Driving through Tobago’s rainforest is like meditation. Free from human noise, the silence is filled instead with the heartbeat of life in harmony with nature, and the deeper you go, the more you begin to feel in harmony with it yourself. The blue-crowned motmot that flew alongside me for a few minutes, the nanny goat that made me wait patiently while she crossed the road with her kids (even stopping mid-crossing to suckle), the canary-yellow butterflies that flitted between the lush rainforest flora, and even the impassive cows lying in shaded spots, hardly moving but for a blink and a flick of the tail — they all seemed, in that moment, to share the same heartbeat as me. Tobago, petite and serene sister island to bustling and boisterous Trinidad, lies near the end of the southern Caribbean island chain, close to Venezuela. She’s a stunning tropical beauty, from the tops of her verdant cloud-forests to the depths of her azure waters. Everywhere your eyes fall, there’s a vivid kaleidoscope of life. Her people, possessed of a friendly and accommodating nature, give new meaning to the term “unhurried.” Even Father Time goes on vacation here — everything slows to a crawl. “Island life on island time” undoubtedly describes the Tobago experience. The island is primarily mountainous, with the eighteen-mile-long Main Ridge running along its spine. The south-western tip of Tobago is a coral limestone bed, built up over centuries. Numerous rivers and streams irrigate the lush foliage that still covers nearly half the island, and the coastline is indented with the broad arcs of picturesque bays, wave-crested rocky outcroppings, and romantic little secluded beaches. It’s easy to see why the Walt Disney Company chose Tobago as the location for filming the 1958 film Swiss Family Robinson, standing in for a deserted Pacific island. 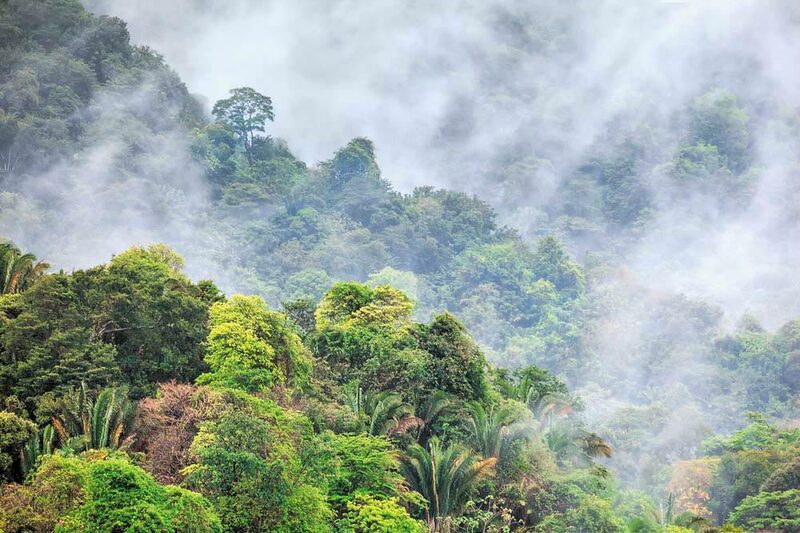 But this laid-back little island, just twenty-one miles across and seven miles wide, carries an even greater legacy on her slender shoulders: the Main Ridge Forest Reserve is on record as the oldest legally protected rainforest in the Western Hemisphere — a landmark in the history of environmental preservation. In the early eighteenth century, a scientist by the name of Stephen Hales convinced the island’s plantation owners that if they cut down the forest they would destroy the balance of nature and reduce the island to a barren desert. It was due to his efforts that fourteen thousand acres of the Main Ridge forest were designated as a protected Crown Reserve in April 1776, by virtue of a royal ordinance that declared it to be “for the purpose of attracting frequent showers of rain upon which the fertility of lands in these climates doth entirely depend.” It was “the first act in the modern environmental movement,” according to Scientific American magazine, and this green bounty is enjoyed to this day by Tobago’s citizens and visitors alike. 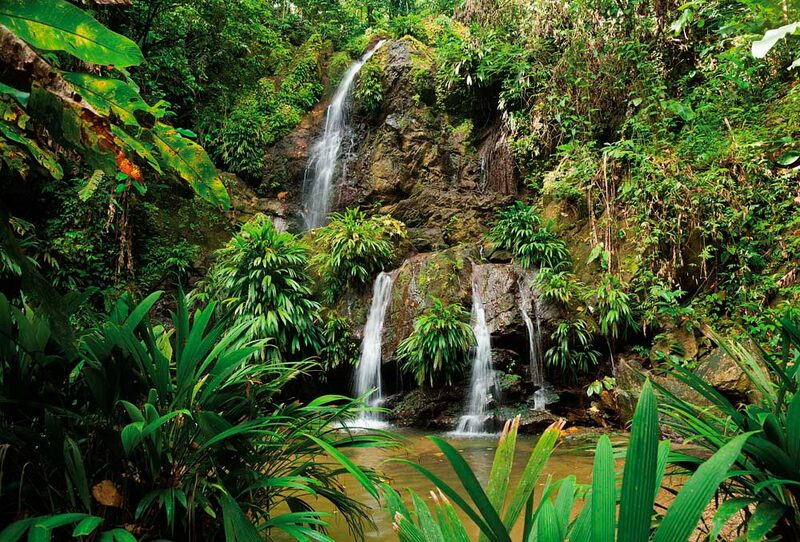 Tobago, due to her ancestral heritage, has a combination of three vital spheres of biodiversity: rainforest, reefs, and wetlands. As a result, the island has one of the highest diversities of plant and animal species in the entire Caribbean, including endemic species, found nowhere else in the world, like the Bloody Bay poison frog, the (harmless) Tobago false coral snake, and the Tobago coralbrotula, a small reef fish. In the rainforest, giant trees like the legendary silk cotton (believed in many cultures to have supernatural powers), samaan, immortelle, flamboyant, and African tulip provide home and shelter to over six thousand species of plants and animals, including one of the highest densities of tropical bird species in the world (two hundred and ten, at last count). 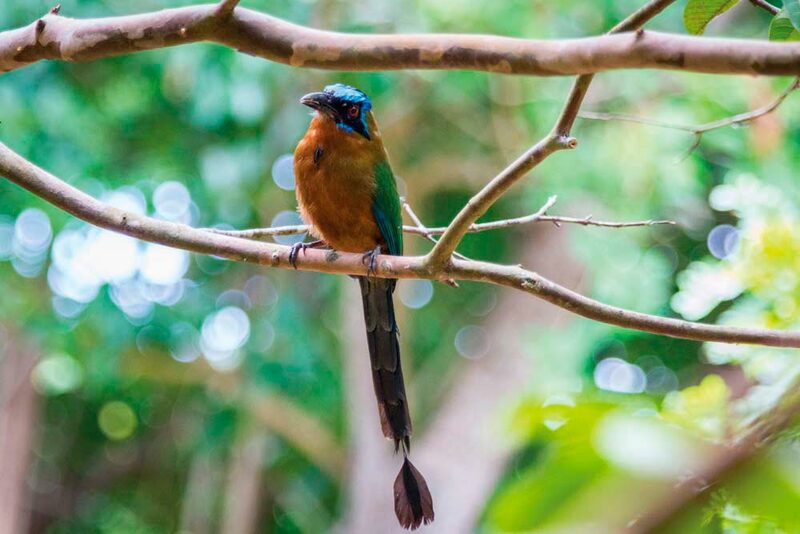 Birdwatchers travel here in search of blue-crowned motmots, rufous-tailed jacamars, purple honeycreepers, red-crested woodpeckers, and rare white-tailed sabrewing hummingbirds. 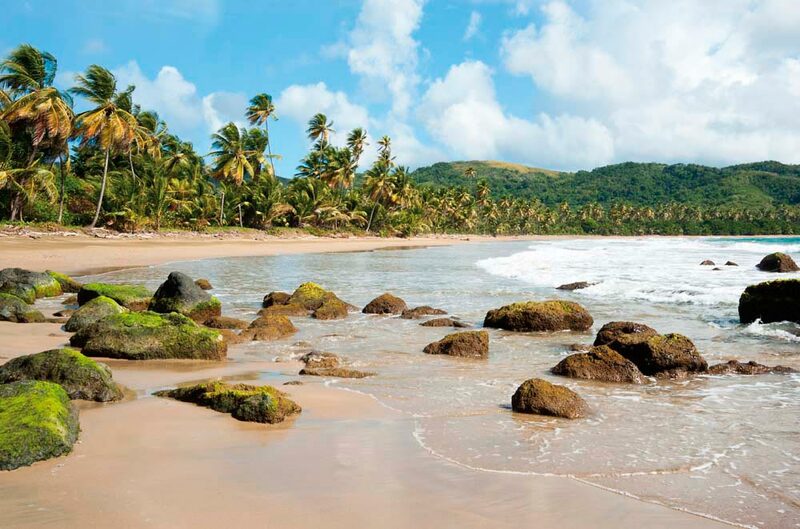 Little Tobago, a tiny star-shaped island situated off Tobago’s north-east coast, is considered to be one of the Caribbean’s most important seabird sanctuaraies. At least fifty-eight species have been recorded on the island. And Tobago’s underwater world puts on yet another display of vibrant colour and life. Its blue-green waters are ideally situated to propagate the growth of the stunning reefs that fringe the island and make it a diver’s dream. The influence of freshwater runoff bearing nutrients from the Amazon and Orinoco rivers, carried in by the Guiana Current, produces an abundance of plankton and allows for the prolific growth of marine life. About three hundred species of coral, in vivid hues of red, purple, orange, and yellow, and more than six hundred species of fish inhabit Tobago’s reefs, including parrotfish, angelfish, blue chromis, creole wrasse, and butterfly fish, as well as sea turtles and squid and other marine life you might prefer to greet from afar: eels, barracudas, jewfish, manta rays, eagle rays, and the odd reef shark. 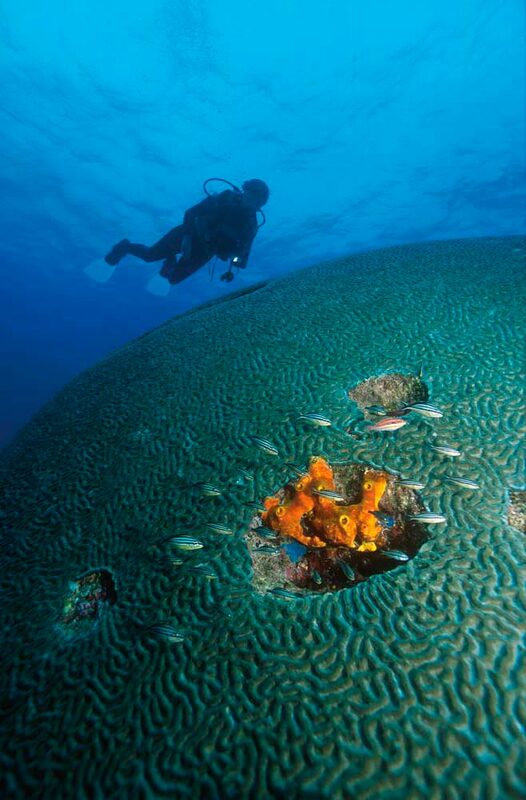 These rich waters are also the reason for the massive size of some of Tobago’s hard corals, such as the giant brain coral off Speyside, over six metres in width. It lies in an exquisitely pretty section of reef known as the Japanese Garden, because of the sea whip corals that resemble bonsai trees. There, courtesy of my dive master, I made the acquaintance (from a very respectable distance) of a small nurse shark that inhabits a shallow cave. He’s clearly docile and accustomed to curious humans, because he never moved a muscle as we swam by and gawked. It was a decidedly exciting thrill, but the closest I ever want to come to a shark. 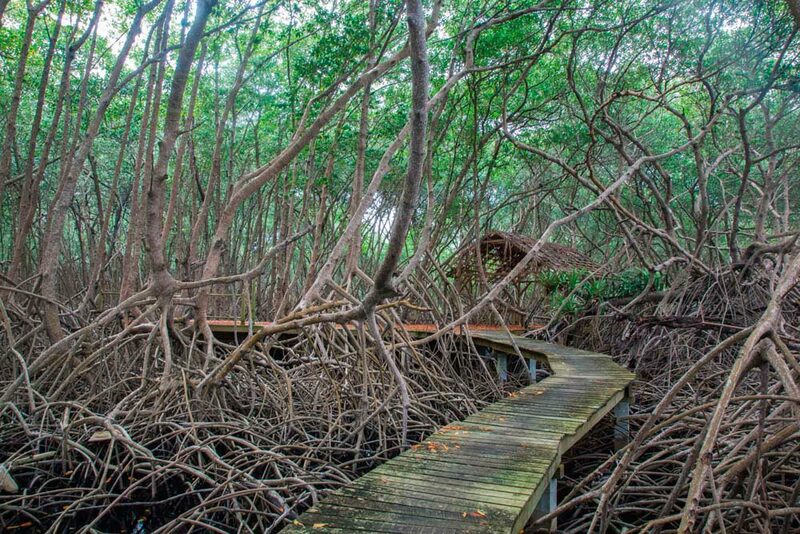 Tobago’s wetlands are another cradle of life, nurturing many other micro-ecosystems. The largest is the Bon Accord Lagoon, covering seventy-seven hectares, home to a population of spectacled caimans. An intertidal forest made up of plants and trees adapted to marshy soil and periodic inundation by the sea borders the coastline at the southern end of the island. Many marine fish spawn here, as well as crabs, oysters, seabirds, and other wildlife. Wetlands also protect coastal areas and shorelines from degradation and damage from storm surges by slowing runoff and trapping soil in their web of roots. 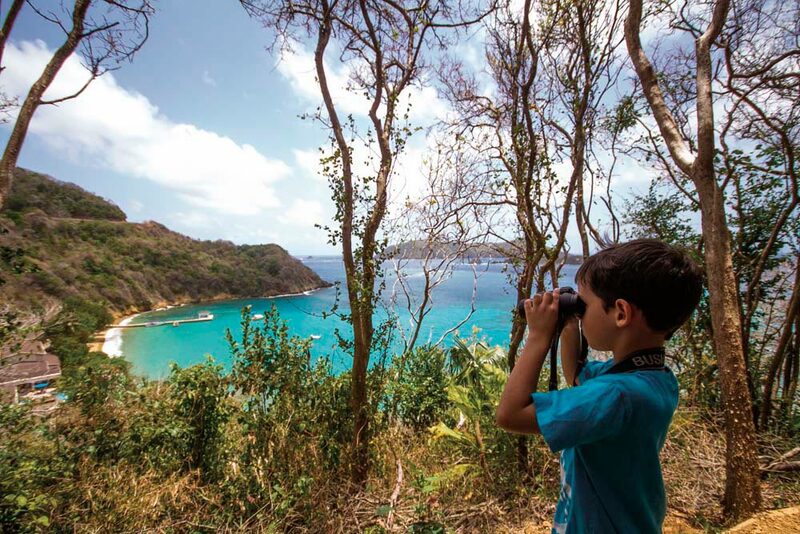 Protecting Tobago as a singular area of such complex biodiversity is critical. 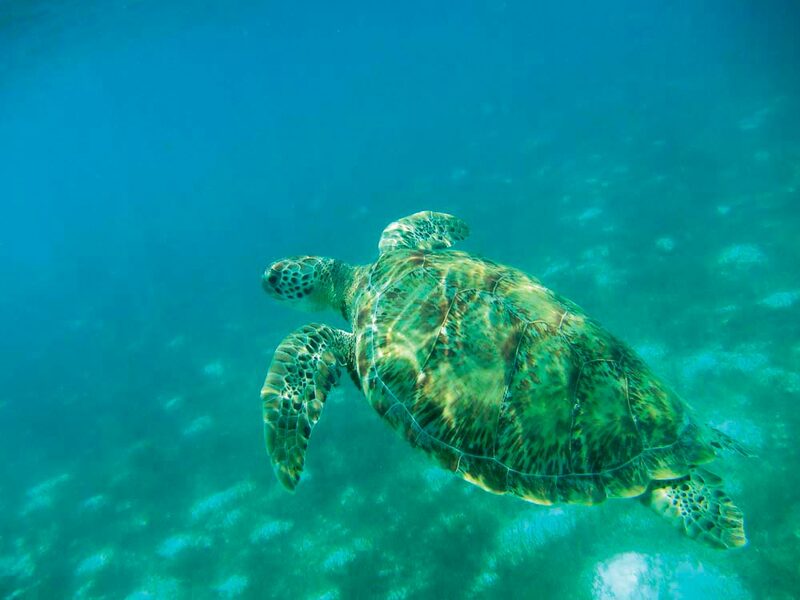 The island’s tourism sector is slowly but surely adopting sustainable practices to help preserve this unique ecological heritage. 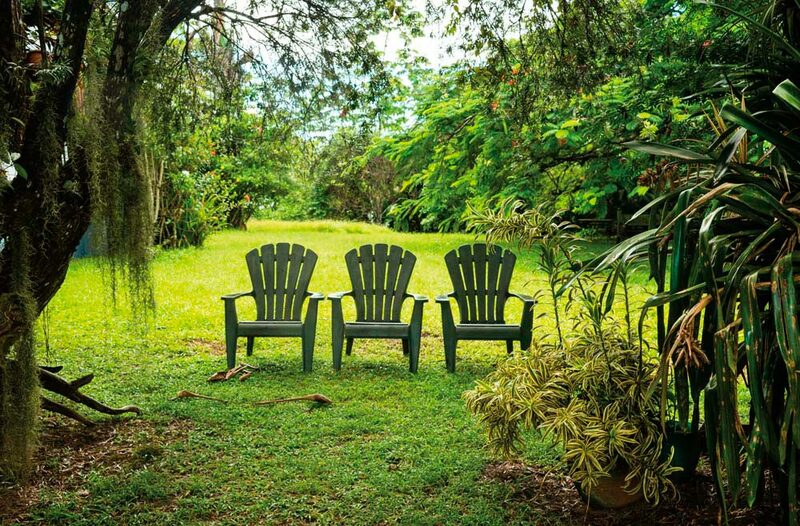 Visitors can play their part by asking their host, hotel, or tour guide about what green initiatives they have in place, and by simply being mindful of the fragility of Tobago’s forests, wetlands, and reefs. The island’s official motto, “Pulchrior Evenit,” is a Latin phrase that means “She becomes more beautiful.” Locals and visitors alike have a part to play in fulfilling that prophecy — and ensuring that Tobago’s natural beauty can continue to soothe the human spirit for generations to come. 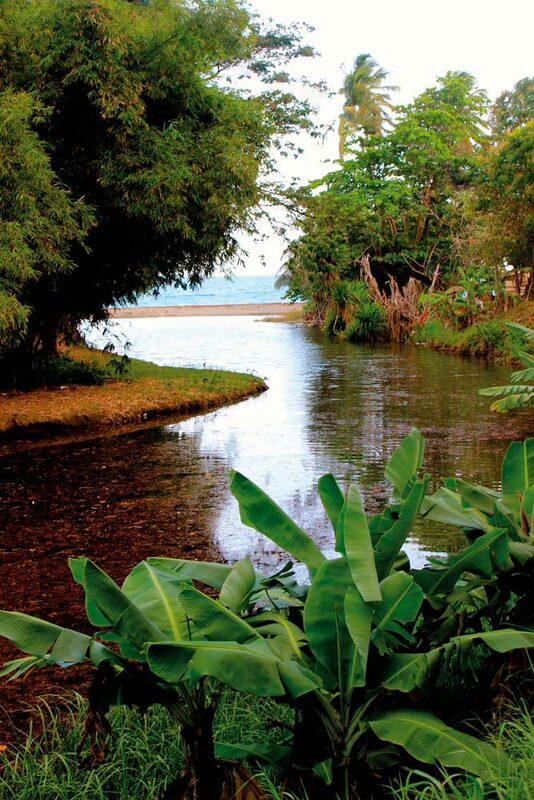 Blue Waters Inn is nestled in its own secluded bay among forty-six acres of lush greenery, directly across from Bird of Paradise Island, the oldest nature sanctuary in the Western Hemisphere. Nature-lovers have been immersing themselves in the eco-experience of Blue Waters Inn for decades, and the resort has recently developed its own nature trail where guests can hike at their leisure, taking in the incredible view. Every room is waterfront, luxurious, and serene. They also have their own dive facility and are minutes from some of the very best dive spots in the region. The acclaimed and award-winning Pigeon Point Heritage Park is widely known for its clear, calm waters and all the amenities you can possibly ask for to enjoy a full day at the beach. The park, however, has a lot more going on than just a beach excursion. There are also on-site accommodation, meeting and conference facilities, restaurants and bars, shopping, and of course one of the best places in Tobago to host weddings and receptions. Tropikist Beach Hotel and Resort offers a panoramic view, ideally located near the airport, with easy access to beaches, local attractions, and activities. Bask in the sun, enjoy a cocktail as the sun sets. Tropikist . . . Your Tropical Destination. Celebrating ten years this April, The Shade Nightclub is Tobago’s premiere nightspot. Opened in 2005 under a carat-thatch roof and surrounded by large samaan trees, the bars and tables all made from naturally cut wood slabs, The Shade serves up Tobago’s best vibes until sunrise every weekend, with custom cocktails, special guest DJs, and appearances by local artists and entertainers. When a nightclub celebrates a tenth birthday, you can bet it’s a special place.